For aftermarket front strut nuts from Bilstein, Koni, etc, a 22mm strut socket (Stahlwille 1051),17mm box end for aftermarket rear upper strut nuts. One alternate for a 21mm strut socket is a 13/16th spark plug socket, put the long end of a standard length Allen wrench through the top. 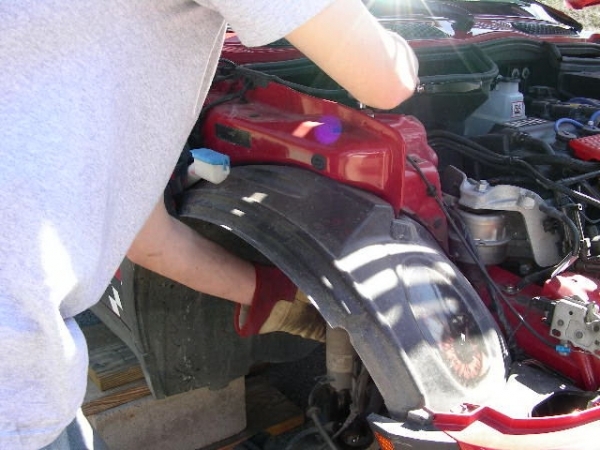 Lift the Vehicle and place on stands, remove the wheels, pull the front brake lines and ABS/pad sensor wire off the strut, and disconnect the stock drop link from the strut using a 16mm socket for the nut and a 17mm open end wrench to hold the bolt from behind the mount. 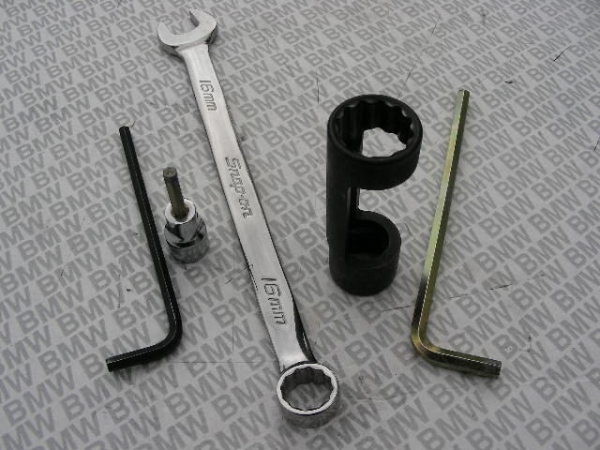 The drop links shown during the spring install procedure are aftermarket that require a 14mm socket and 13mm open end wrench. The Cooper install was performed by Justin Davis (justintime). 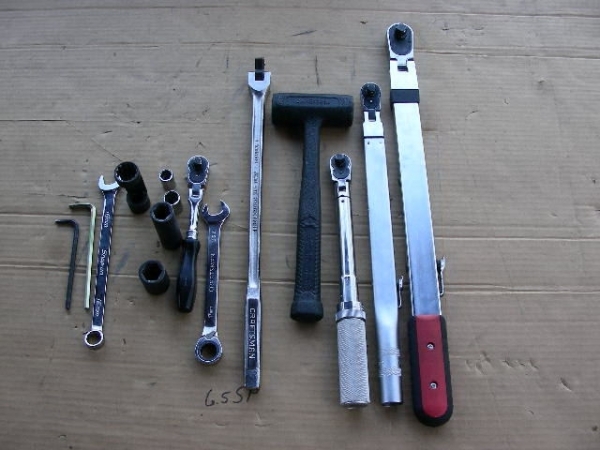 Remove the pinch bolt with an 18mm socket, using a breaker bar or long handle ratchet. R56 models have a flare nut on the end of the pinch bolt (left pic), loosen the bolt end only on the R56 (right pic). 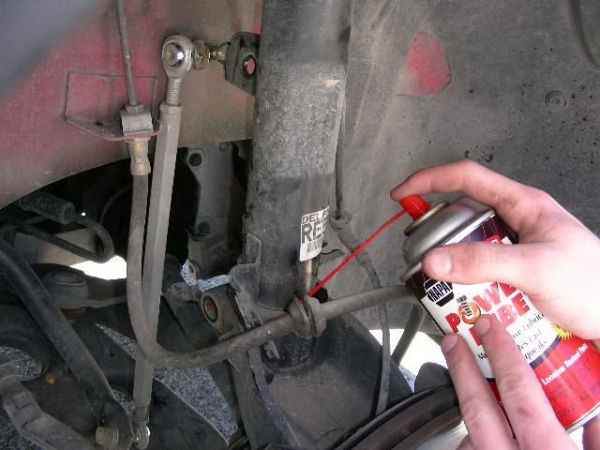 Apply lubricant to the lower end of the front strut where it enters the steering knuckle. 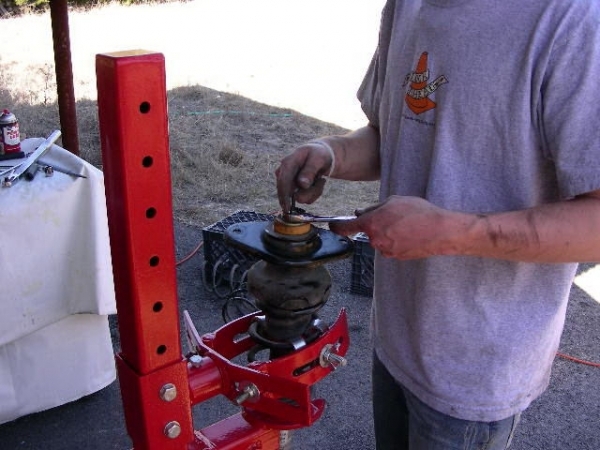 Place a stick on the jack’s lift pad and use as leverage under the lower spring perch to compress the spring and push the strut out of the steering knuckle. A few taps with a dead blow hammer may be needed to break it free. 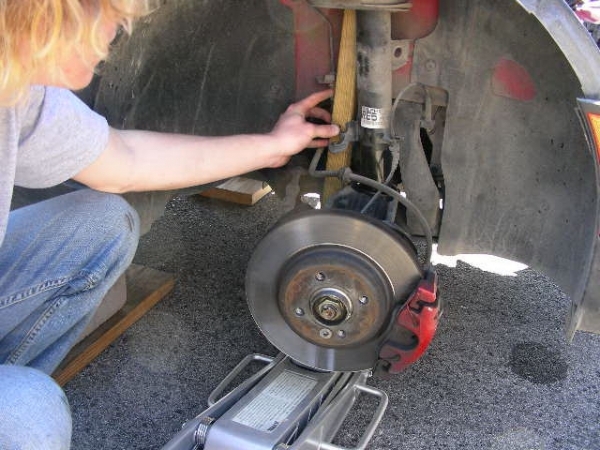 An alternate approach is to remove the two 13mm bolts from the outer ball joint bracket, disconnect from the steering knuckle, support the brake rotor with a jack and lower; some maneuvering of the knuckle will be needed. Exercise cautions if a hand is needed to stabilize the strut, do not place the hand or fingers between the strut & stick or any place where it could be trapped if the strut shifts abruptly. 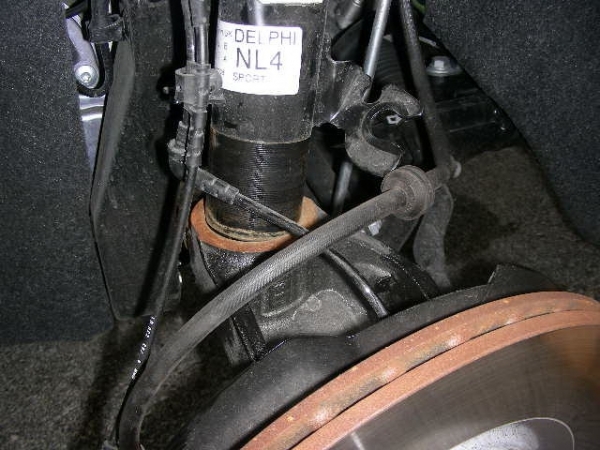 R56 front struts will pull free without compressing the spring. 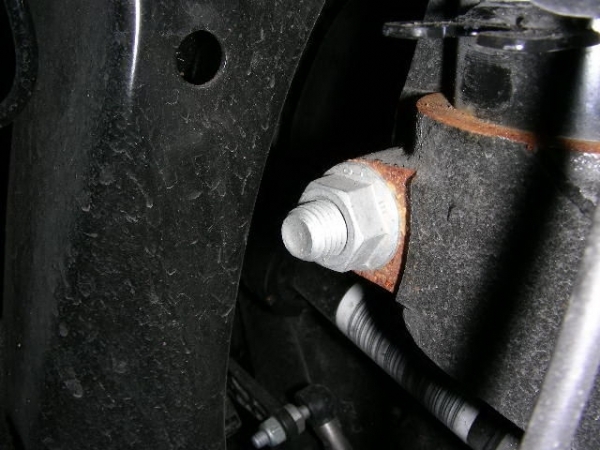 Unscrew the guide support nuts with a 13mm socket untill they are loose, then while grasping the strut, unscrew the nuts the rest of the way by hand and lower it carefully feeding past the brake line & wire then remove outward and upward from the wheel well. Remove the bearing dust cap and place the strut on its side. 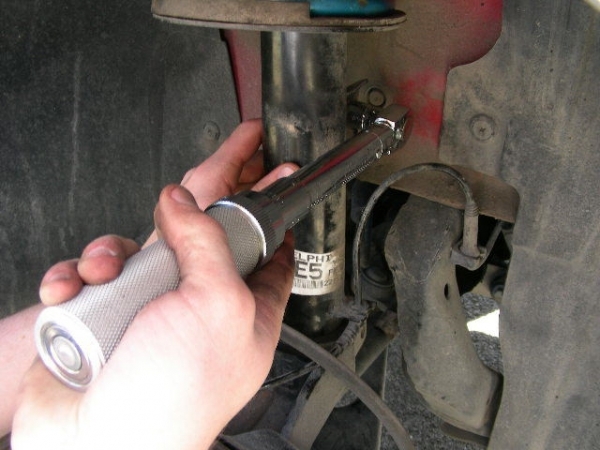 Use a block of wood to leverage the Allen wrench and body weight to leverage the strut shaft nut using the special 21mm (22mm for aftermarket) strut socket on a long breaker bar. This can be performed with the strut upright but it requires much upper body strength. 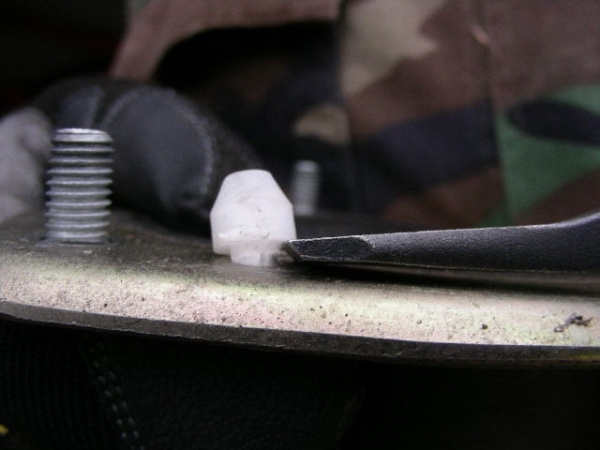 Unscrew the top nut until the nylon lock has cleared the shaft threads. 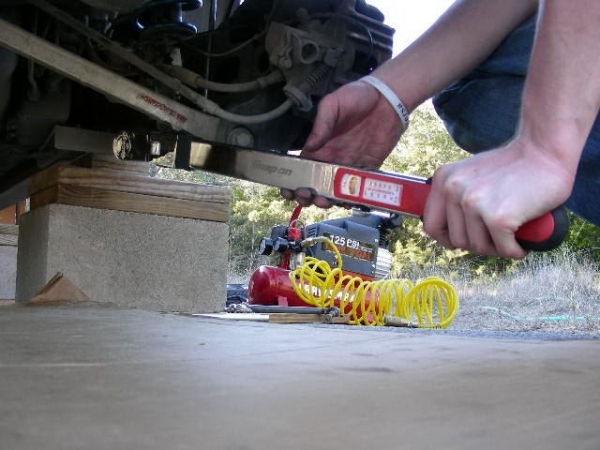 The quick way is to use a thin wall deep socket on an impact wrench with the strut on its side. 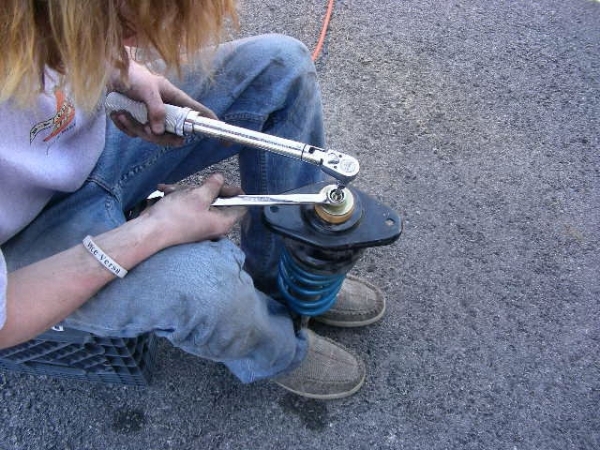 Without a spring compressor the nut can be removed safely using the “buddy method”. As a partner applies weight on the guide support, unscrew the last remaining threads, the partner releases pressure smoothly, and off comes the upper mount. justintime and an associate demonstrate how it’s done. 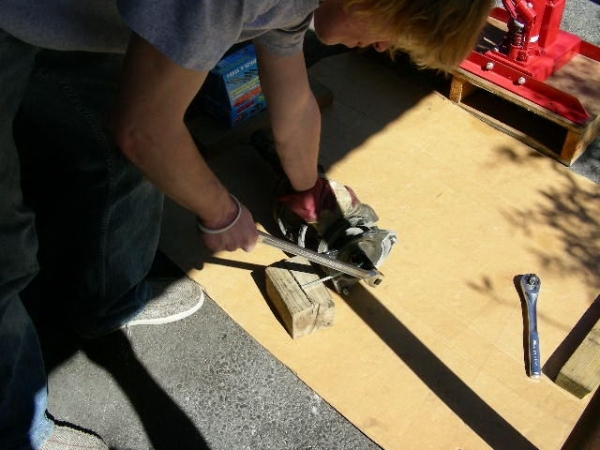 A spring compressor will provide stability and facilitate removal if the install is performed solo. R56 Guide supports have a nylon stud which can be removed to allow the support to shift providing more negative camber. After the replacement spring has been installed and the strut shaft nut tightened to 47 ft-lb, feed the strut into the strut tower, guiding the bolts through their mounting holes, while still grasping the strut, screw on the guide support nuts by hand to hold the strut in place then complete the fastening with a ratchet and torque to 25 ft-lb. On R56 models with the nylon stud removed, push the strut towards the engine to increase negative camber before tightening the nuts. 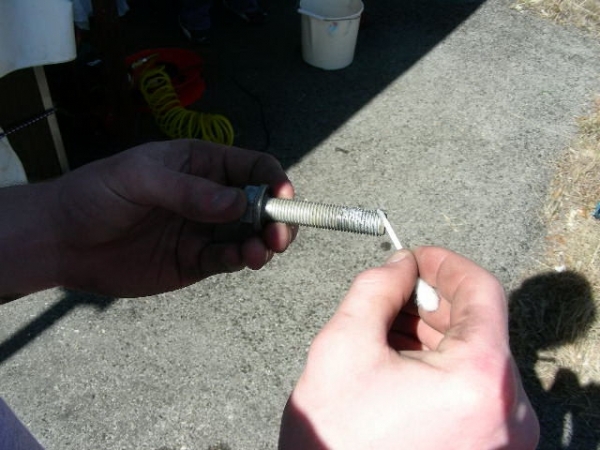 Clean the pinch bolt threads with brake cleaner and a wire brush; afterwards apply a small amount of anti-seize. The pinch bolts are exposed to oxidizing elements; anti-seize will help prevent a frozen bolt that could shear when attempting to extract. 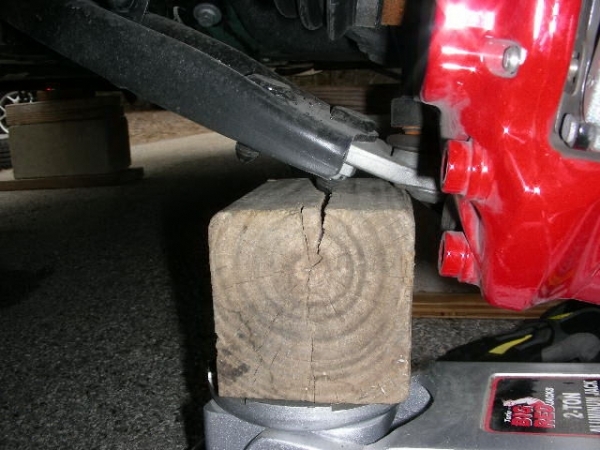 Place a block of wood on the jack lift pad and raise the steering knuckle from under the outer ball joint nut. 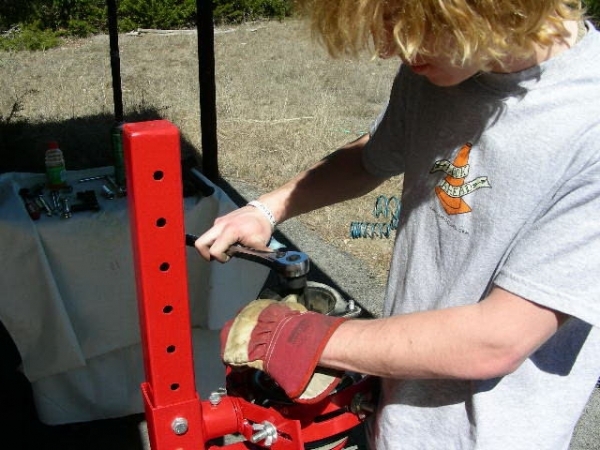 Install and torque the pinch bolt to 60 ft-lb. The R56 outer ball joint is attached differently, the lift point will be under the ball joint bracket's control arm bolt. Torque the drop link to strut body at 41 ft-lb. Be sure to place the drop link behind the strut to avoid making this mistake; oops. Return the brake line and ABS wire to their strut body mounts and replace the bearing dust cover cap to declare the front strut has been completed; yippee! 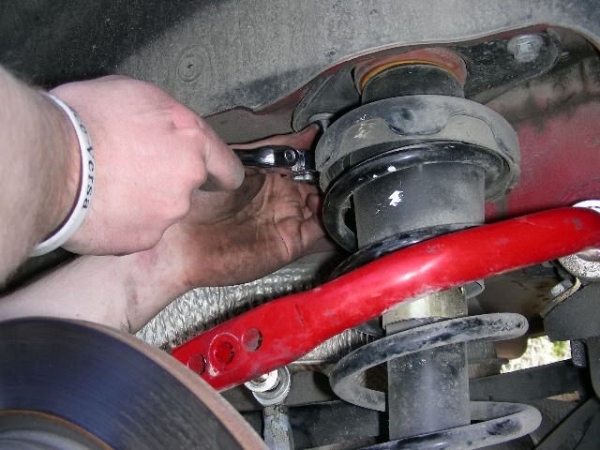 Moving to the rear strut, remove the anti-sway bar drop link. 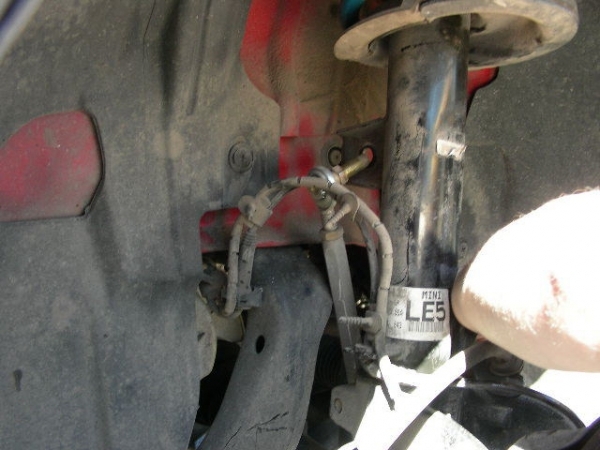 Pull the brake line & ABS sensor wire from the strut body. 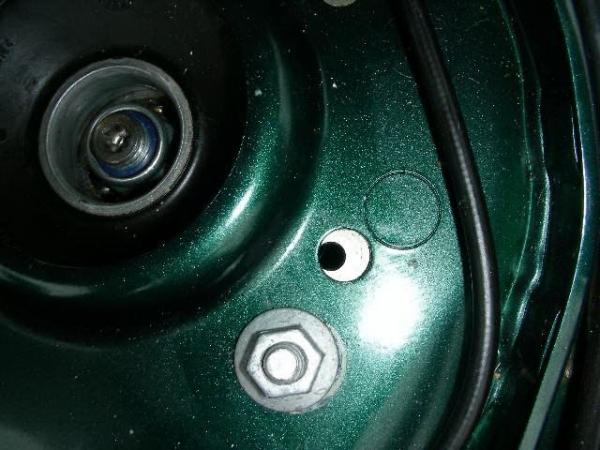 Unscrew the bolts on the strut’s upper mount using a 13mm socket. 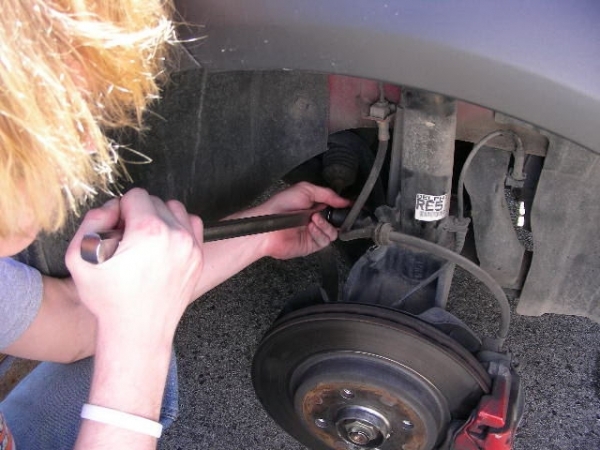 Loosen the lower strut bolt with a 21mm socket, breaker bar, or long handle ratchet, unscrew, grasp the strut before removing the bolt completely to keep it from dropping and remove the strut. 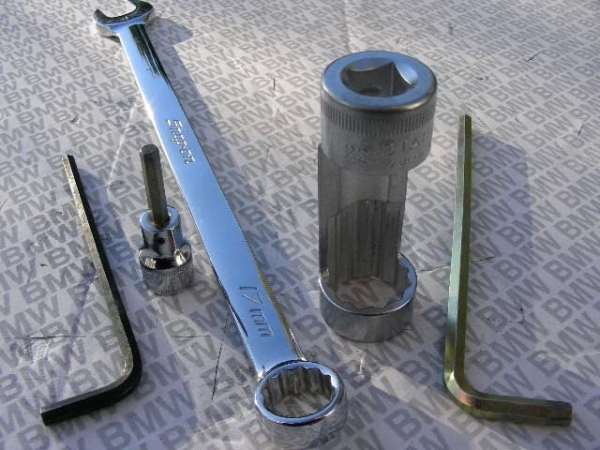 Remove the strut shaft nut with a 16mm box end wrench and long 5mm Allen wrench. 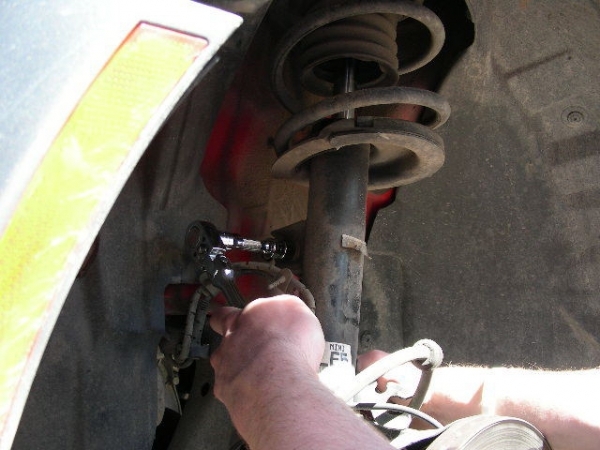 A spring compressor can be used on the stock springs but the Koni springs had to be installed using the “buddy method”. 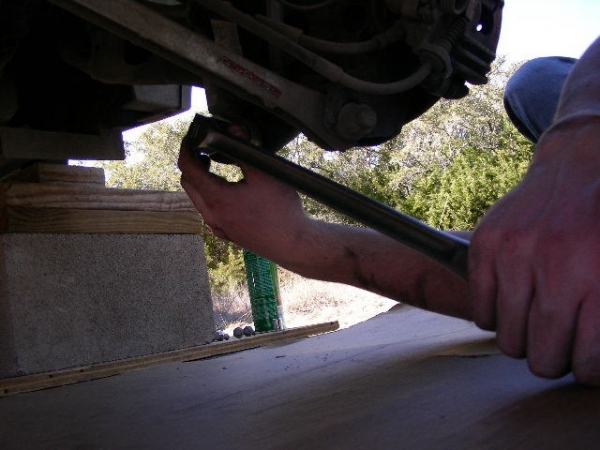 Torque the shaft to 22 ft-lb using a 5mm Allen socket on a torque wrench in the reverse position while holding the nut with a 16mm box end wrench. 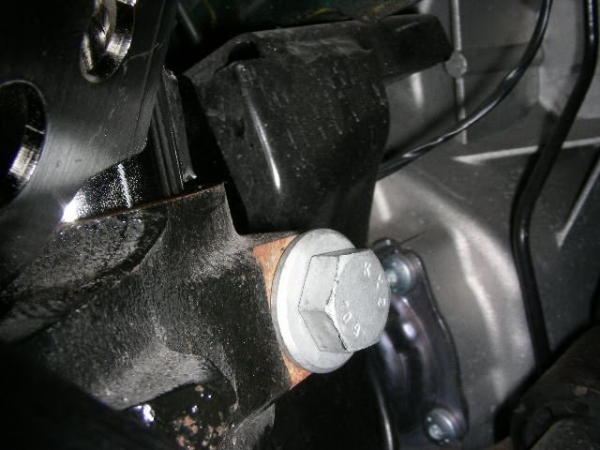 As with the front pinch bolt, clean the rear strut lower mount bolt and apply a small amount of anti-seize. 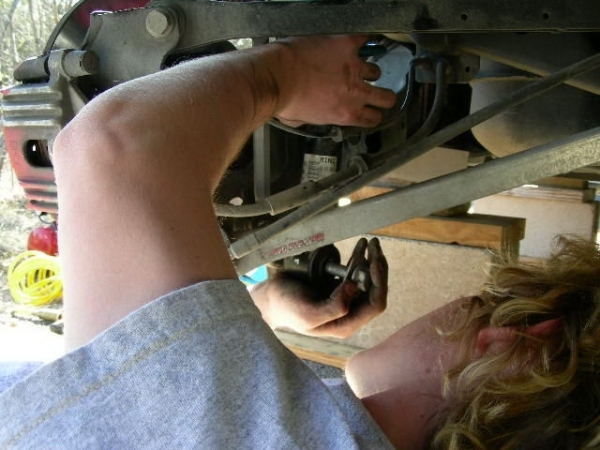 Lift the strut into place under the vehicle and guide the lower mount bolt into place. Screw the bolt in until tight but don’t apply complete torque at this time. 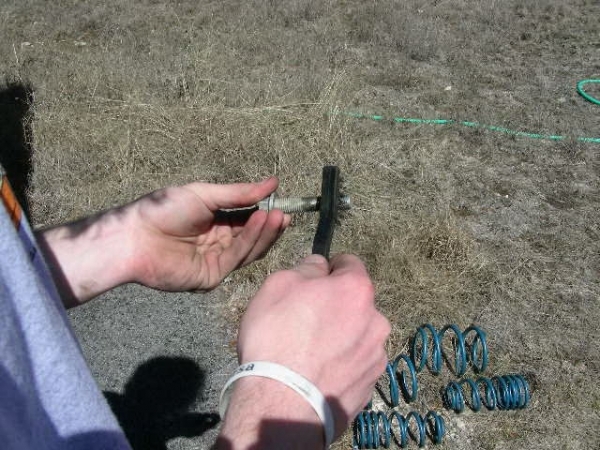 Clean the upper mount bolt threads and apply a small amount of anti-seize. 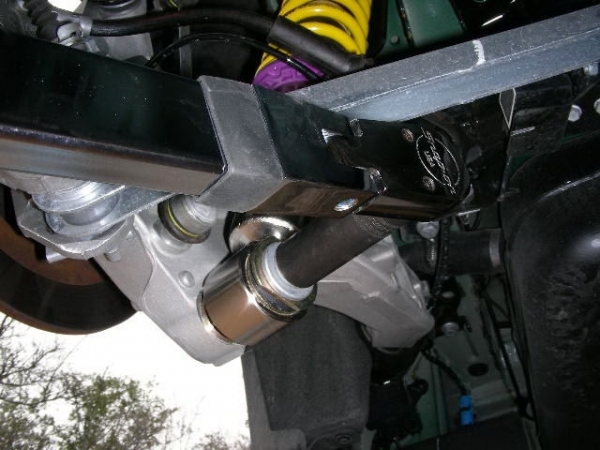 Raise the trailing arm with a jack and position the top of the strut within the chassis recess, line-up the upper mount holes and install the bolts, torque to 41 ft-lb. Torque the lower strut mount on R50-53 models to 103 ft-lb. For R56 models torque to 121 ft-lb. 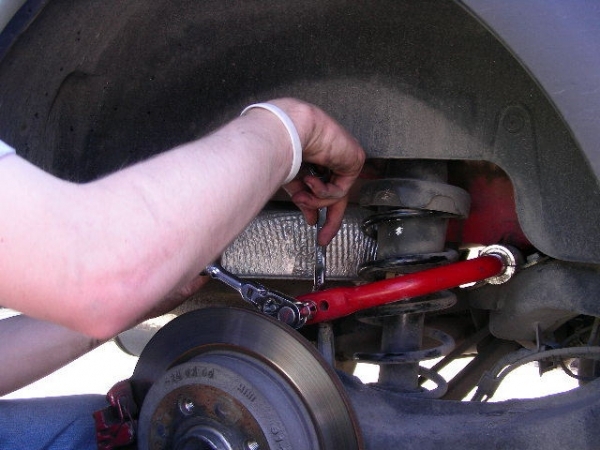 Put the brake line and wire in their strut brackets, replace the lower bolt dust cover if your model has them, remount the wheels, torque the lug bolts at 89-92 ft-lb for R50-53, or 103 ft-lb for the R56 models, lower the vehicle.